Create Wearable Art, No Experience Necessary. Artists in Canada Approved Supplier. Wearable Art increases your brand awareness and provides extra income. For some, it is the end game. Over the past few months I have received a number of emails from artists concerned about being approached by clothing manufacturer's from off shore and elsewhere who may or may not borrow your images on-line without your consent. Since these emails, I did some further research and found a very credible Montreal supplier, Le Galeriste, who is capable and is doing some amazing fashion designs using images of paintings and artwork by Canadian artists. They pay real wages and employ workers and designers in Montreal and all production is done in their factory. You are also dealing with Canadian dollars, not US currency, so quite a saving. Here is how to start. All you have to do is fill out the information form and send them a high rez image of your work, they will do the rest. In 48 hours you will receive a layout to approve. Le Galeriste guarantees you own the copyright and nothing will be produced without your consent and images will be kept safe. 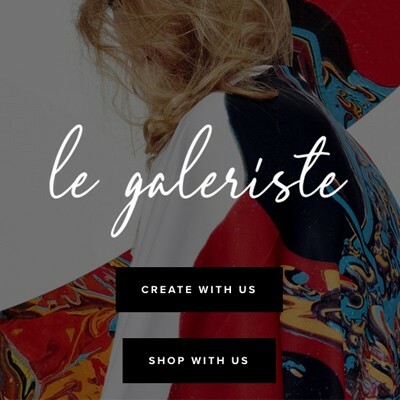 Artists in Canada is collaborating with Le Galeriste to provide you with a secure portal to produce fashion items to order and sell. They also offer a royalty program if you don't want to sell your own items. For instance, as a guy, what do I know about women's fashion? I can send them an image that I think looks great. They produce an item, when it sells, you get a royalty cheque – Sweet! They do produce a great T-Shirt design that is popular that your art could look great on. Show up at your next exhibition wearing the look of your show. Why not? Of course if you sell them yourself you will make a lot more revenue and you only need to order as you need them. People can go on-line and order as well, so they can choose the right sizes etc. You can read about their process of di-sublimation printing on their website. It is colour fast, durable and looks rich on an array of fabrics. ORDER TODAY! 15% off on your first order. Also, you can order a minimum of 1 item to start (normally it is 3 items) These offers are exclusive to Artists in Canada artists using our portal page on Le Galeriste's website. As artists start to create more fashion items we will create a special category (Wearable Art) and you will be able to sell your garments etc. in our Art Sales Gallery. If you send us images of your creations we will produce a feature on them and help promote your products. The Art Sales Gallery is being rebuilt this summer, which will better handle sales images. We would love to hear your feedback, talk to you soon.